On hundred years ago today, on the eleventh hour of the eleventh day of the eleventh month, France and Germany signed armistice documents in a railway carriage in the forest of Compiègne, France, bringing the First World War to an end. 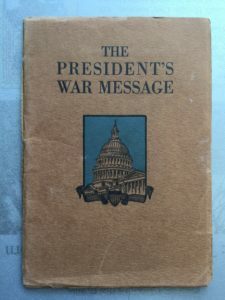 Paul Elder & Company published two short books in connection with the War. 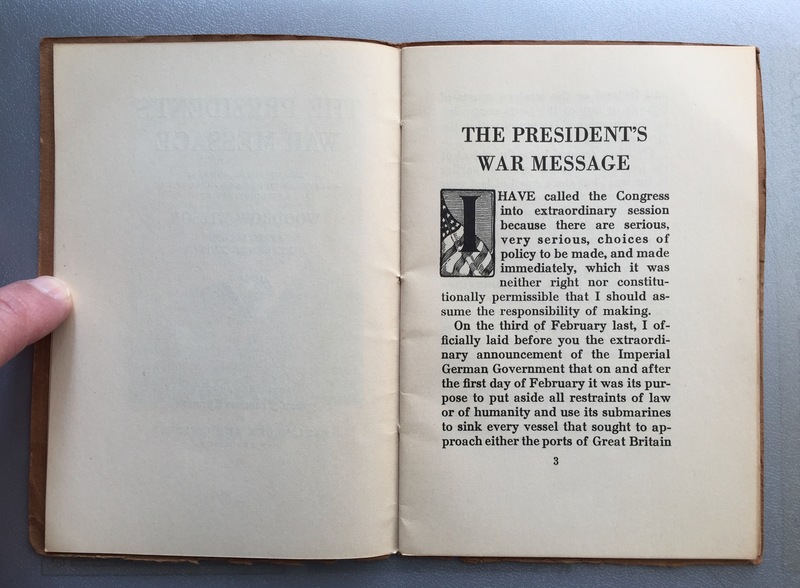 The first of these, The President’s War Message, is the text of Woodrow Wilson’s address to Congress on 2 April 1917, asking that a state of war be declared between the United States and Germany. The United States had remained neutral up until then, despite such events as the sinking of the ocean liner RMS Lusitania by German submarines on 7 May 1915, which killed 1,198 people including 128 Americans. Wilson insisted that Germany stop attacks on passenger ships, to which the Germans agreed. 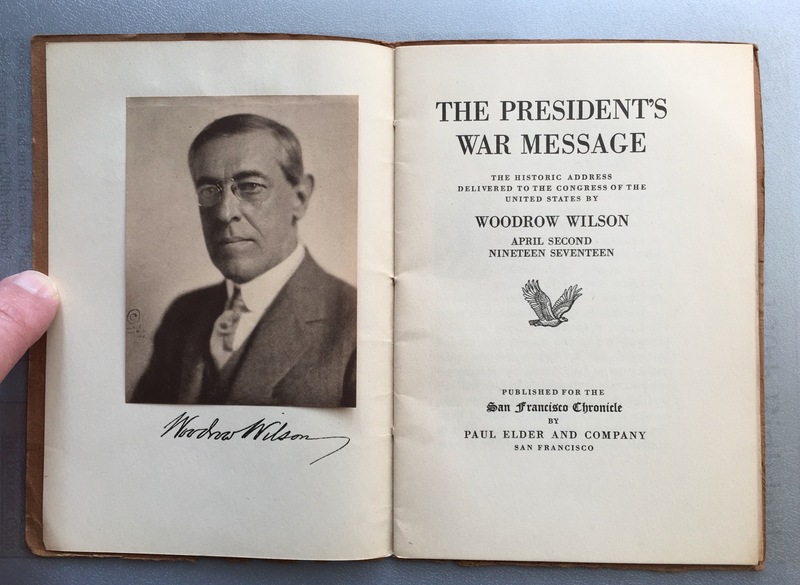 Wilson’s reelection in 1916 was attributed partly to his success in keeping the US out of the war. 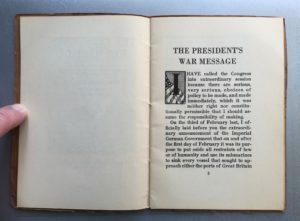 But in January 1917, Great Britain intercepted a German telegram informing Mexico that they would be resuming attacks on passenger ships, and offering to help Mexico reacquire Texas, New Mexico, and Arizona. 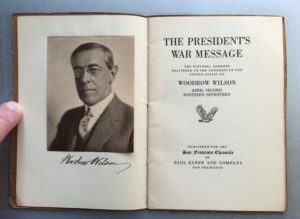 Wilson released the telegram to the US public, and used it as justification for going to war. 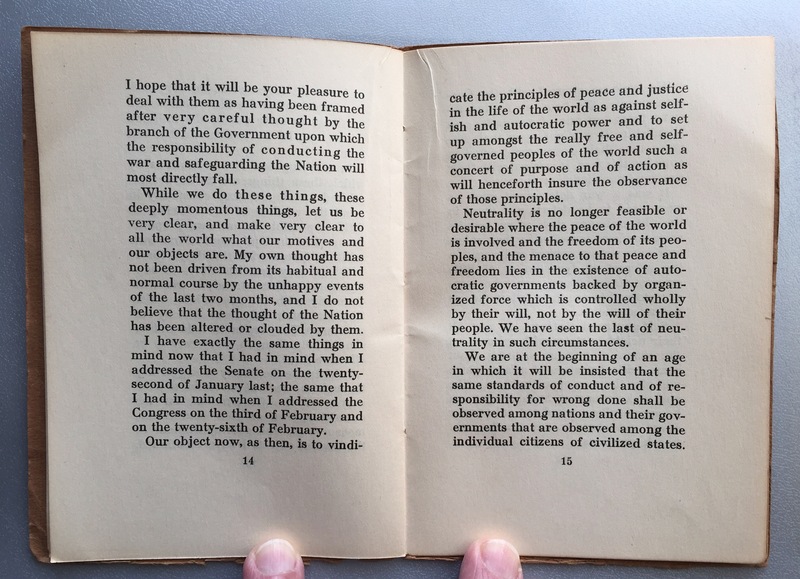 After Germany sank seven American merchant ships, Wilson gave his speech on April 2nd, and Congress declared war on April 6th. Germany had launched the March 1918 “Spring Offensive” in an attempt to win the war before the Americans arrived. They advanced to within 75 miles of Paris, but there the offensive stalled. By summertime, 10,000 American soldiers arrived in France every day. The resulting “Hundred Days Offensive” was the decisive campaign of the war, and by November the Germans sued for peace. As Adam Hochschild wrote in the New Yorker on 5 Nov 2018, the war ended as senselessly as it started, with more soldiers perishing on Armistice Day–2,738 killed, 8,206 wounded or missing–than did in Normandy on D-Day, 1944. Though the Armistice was signed at 5am, it would not take effect until 11:11am, and many Allied divisions fought on, trying to gain ground that would be conceded just hours later. The last American died at 10:59am when he charged a German machine-gun crew, and ignored their pleas to stop. The human toll of World War I was truly horrific. 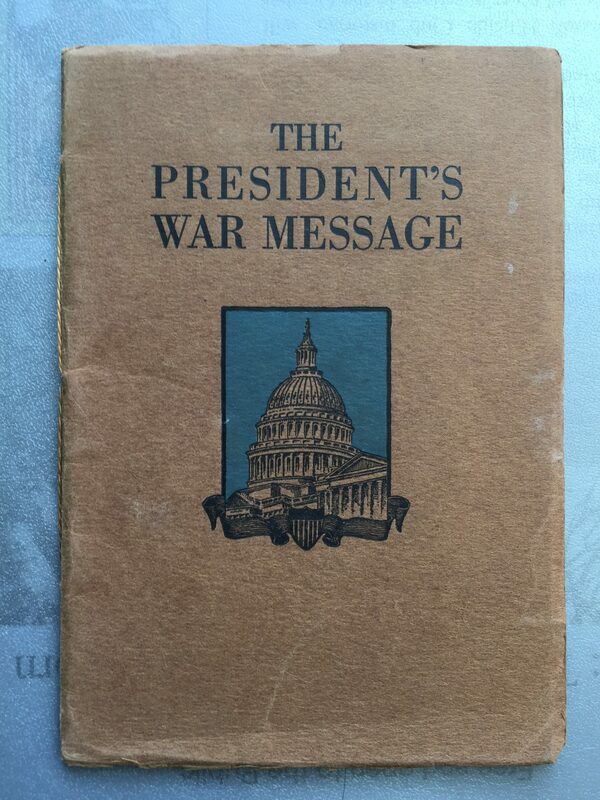 Ten million men died in combat, with twenty-one million wounded (the “Lost Generation”). Almost eight million civilians were also killed, and dozens if not hundreds of cities and towns in France and Belgium were bombed into dust. The war destroyed Europe’s old order, along with the Austro-Hungarian, Russian, and Ottoman Empires. 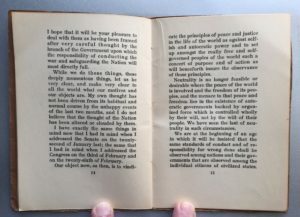 My personal wish for all of us: may we see the day when war and bloodshed cease, when a great peace will embrace the whole world. Let peace fill the earth as waters fill the sea. 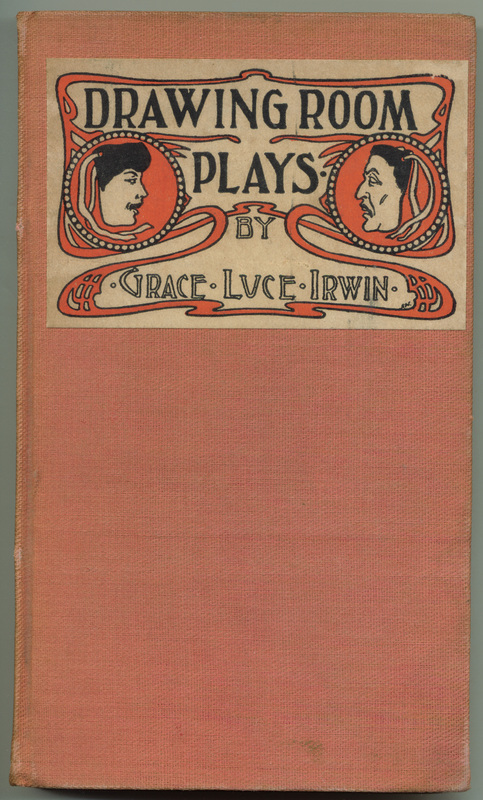 Some works deserve to be forgotten, and Grace Luce Irwin’s Drawing Room Plays (1903) is one of these. Grace Adelaide Luce (1877-1914) grew up in San Diego, and after two years at Stanford University she moved to San Francisco. There she met and married Wallace Irwin, author of Paul Elder’s perhaps best-selling book, Love Sonnets of a Hoodlum. They soon moved to New York City, where Wallace enjoyed success for some years. 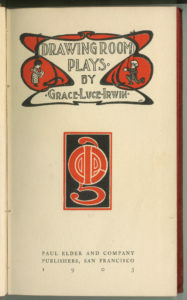 Grace also became a writer, mostly for magazines, but she also authored several books. Why should you forget this book? At the turn of the 20th century it was acceptable in the American media to use overt racism in humor, especially towards the Chinese and Japanese. This is a common theme in Wallace Irwin’s work, and sadly, so it was in Grace Irwin’s writing as well. I will spare you the details. 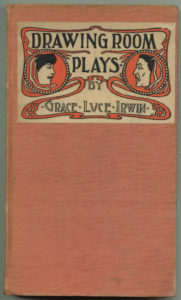 Grace Irwin died on Long Island, New York in 1914 at the young age of 37. She is buried in San Diego. The artwork is by an unidentified artist, initials “A. W.” It does not appear to be Audley B. Wells, whose signatures for other Elder works looks very different. 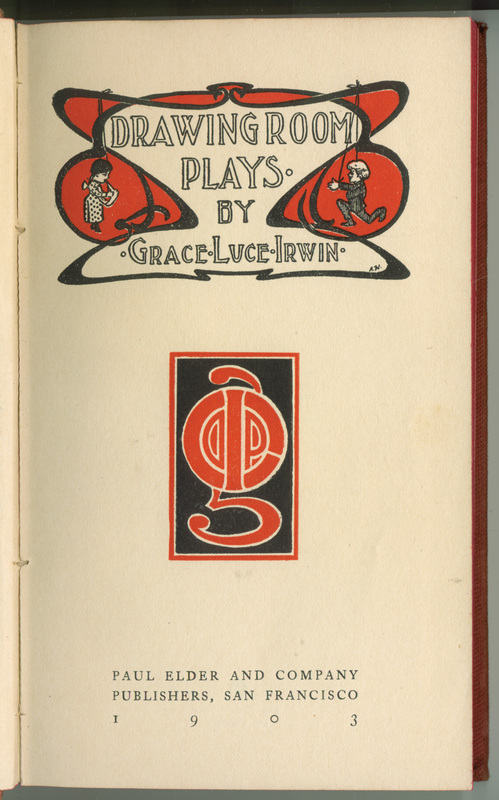 I have been unable to conclusively decipher the curious vignette at the center of the title page, but the circular device may be a combination of the letters D R P G L I (Drawing Room Plays Grace Luce Irwin). I don’t know what the red background squiggle means.